Today we will take a quick look at the Zotac AMP Box Mini with an Asus Hyper M.2 x16 Card installed with a Patriot Hellfire M.2 PCIE SSD. The AMP Box Mini is an external enclosure featuring a Thunderbolt 3 connection (upto 40Gbps) as well as USB 3.1 Gen2 support (10Gbps). It’s compatible with all PCIE add-on cards including graphics cards such as the GeForce GTX 10 series (as an external GPU – pictured below) or PCIE SSDs (as an external storage device). Unfortunately, we were unable to fully test the Thunderbolt 3 and video performance of the Zotac AMP Box Mini fitted with a GeForce GTX 1060 (6GB) graphics card. My PC system sees the graphics card, but fails to establish it as a primary graphics card. Apparently, having the Zotac AMP Box Mini as an external GPU is best configured and run on MacOS/MacBooks. In the end, we chose to test Thunderbolt 3 performance by using the Asus Hyper M.2 x16 Card installed with a Patriot Hellfire M.2 PCIE SSD … it’s now become an external SSD storage device. In terms of performance, I really don’t know what to expect from this enclosure. I suppose by using the Thunderbolt 3 connection, I will get pretty decent read/write speeds from our Patriot Hellfire M.2 PCIE SSD installed inside this box. It’s unfortunate we couldn’t test the unit as an external GPU (Macbook required). 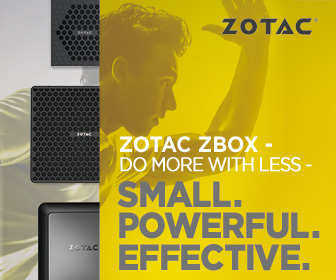 You can buy the Zotac AMP Box Mini (bare bones) for only USD $219 from Newegg.